A surfer was seriously injured by a great white shark on Monday in Australia, but the nearby Margaret River Pro tournament continued without mishap. Crystalline water and big, gorgeous waves attract surfers to the mouth of Margaret River in southwest Australia. Less clear is what has recently drawn at least one large, aggressive shark to this coastline. It might be the whale carcass rotting on one of the surf breaks. Maybe it’s the surfers themselves — several of whom, in any case, have refused to let a little shark mauling spoil their fun. Attacks are a known risk on these beaches. A relatively small shark bit off a chunk of someone’s foot in January. A Margaret River resident wasn’t so lucky in 2013, when he became the area’s third shark fatality in a decade. Last week, a group of American surfers were preparing for this month’s Margaret River Pro tournament when they saw a splash in the water. They flew a drone overhead, and subsequently narrated an Instagram video of two large, finned shadows prowling the shoreline. “He’s in the friggin’ murk!” one man said. “That thing looks pretty big,” said another. Sharks notwithstanding, the event started as planned last week. 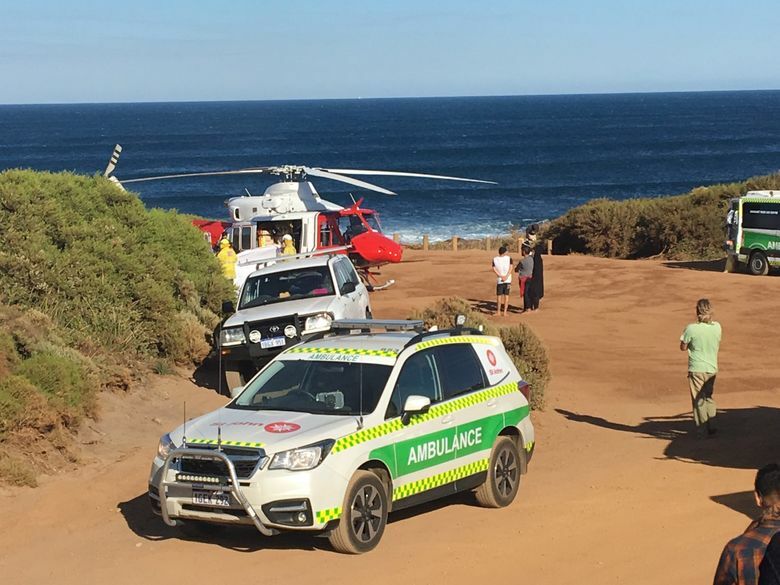 On Monday morning, shortly before the start of round two in the women’s event, a tournament crew worker was surfing a few miles north of Margaret River — near Gracetown, where the man in 2013 had been killed. The man was still visible from the beach when what one witness described as a great white shark knocked him off his board, and he started to scream. Mikel Basanies told 9 News it attacked the man three times over the next 20 seconds, even as he tried to beat it off. Jovic saw the crew worker, identified as 37-year-old Alejandro Travaglini, finally getting away by “miraculously bodysurfing into a little wave.” Others swam over and helped him paddle to shore, where his legs, both bleeding, were tied off with ropes, and he was carried inland on his own surfboard. Travaglini was then loaded into a helicopter, which The Associated Press said flew him 160 miles to Perth, where he reported to be in stable condition after surgery. As word of the attack made its way to Margaret River, officials delayed the day’s event for about an hour to deploy “additional shark-spotting drones and Jet Skis,” the AP reported. But it was a very clear day, a tournament official explained, any sharks would be easy to spot. So the tournament went on. No sharks troubled the competition on Monday, even as authorities closed the break where Travaglini had been mauled, and several others. A 13-foot shark has been spotted after the attack, the AP reported. A whale carcass had also been found along one beach, according to the ABC, which could be drawing the sharks. And still, a man wanted to surf. By afternoon a sign had been posted at the entrance to Lefthanders surf break, about half a mile from the morning’s attack. The sign depicted a man swimming, a shark, and a large red X. Jason Longrass, 41, would later tell reporters that he failed to see it. So he went into the water — to enjoy his own private surf break. “I was having a ball,” Longrass said. Then he spotted a large shadow in the water, much like the one Travaglini had spotted that morning, and the two the Americans had seen with their drone the week before. “It was beelining straight at me,” Longrass said. He slapped the water, but the shark only sped up. Longrass held up his surf board to the camera. A semicircle of tooth marks, as large as his head, were imprinted on either side. Unlike Travaglini, who left Margaret River on a stretcher, Longrass’ wounds were minor. He drove himself to the hospital that afternoon, the AP reported. He’s not competing in the tournament, which is scheduled to continue throughout the week, by the way.